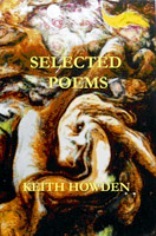 Keith Howden, whose first two books were published by Peterloo in the seventies and eighties, isn’t, I think, as well-known as he ought to be, so this Selected Poems should go some way to rectifying that. A friend of mine whose knowledge of contemporary poetry is generally encyclopaedic hadn’t come across his work until I mentioned it – so I must have been lucky. Way back in my student days in Nottingham (we were studying Alvarez’ New Poetry and Lucie-Smith’s British Poetry Since 1945) our tutor, the kindly Alan Skeels, invited me round to his house, or possibly Keith’s, to meet a friend of his – a real poet. I was impressed. At that time, when Hughes and Harrison were in their ascendancy, Keith Howden was everything I imagined a poet to be: quietly-spoken, tough-minded, Northern, anti-establishment… and he had a book in preparation, which became Marches of Familiar Landscape (Peterloo,1978). Later on I bought Onkonkay (1984) and enjoyed it, but then lost the trail. A good deal of Howden’s subsequent publication has been with Penniless Press who have brought out, over recent decades, a series of volumes and pamphlets that have built on and sometimes re-worked his original obsessions – with moors, streets, chapels, canals; the past gripping the present with its iron hand… These collections are well represented in the Selected along with material from Jolly Roger his meditations on Holbein’s ‘Dance of Death’ (Smokestack 2012), and poems from the magazine Crazy Oik. Some of the characters who appear in the Penniless books are familiar from their incarnations in Onkonkay. Uncle Tom and Auntie Lizzie, who tormented and were in turn tormented by the young Howden, are there in their own right, as is Cracked Mary the mill owner’s daughter, haunted by her memories of Edwardian Blackpool. “Cracked Mary’s Holiday” is a fine sequence, terse and vivid, bitter yet curiously detached. to that poised, hammering gull. said, Not for me, never for you. Each section, echoing with the refrain that Mary will never find the love she longs for, paints an evocative picture of the great era of the seaside holiday: the rank smell of donkeys and hot sand, the Big Wheel, the pier with its ‘sham pavilions’ and ‘the mills’ pupae / unearthed and wriggling in the sun.’ And the culmination, viewed from the top of Blackpool’s great tower, is forensic in its refusal to make any kind of judgment about the cruelty of events. Cracked Mary’s photographs are fascinating in themselves, so it’s a bit disappointing to see them somewhat digitally squashed in this edition and a little darkened in the printing. There are also a couple of punctuation literals and the unnecessary misplacement of a stanza across a page divide, which don’t really serve the poem well. It’s invidious, I realise, to pick up on such things when what’s important is the writing, but if the reader’s confidence is undermined it can lead to doubts. I wasn’t quite sure later, for instance, whether the three successive ‘d’s in ‘Bladddering Whitsun’s banners, / infidel wind shudders / the flexible architectures / of Zion’ (“Roads: Whitsun”) was a brilliantly intentional device or merely a happy accident. Jack Denison and Jack Barlow are both survivors from that second volume who take centre stage in later books. The former, a (possibly fictional) mining engineer whose hands were severed in a pit accident, stands as both victim and representative of a society built on ruthless economics that leave him ‘All the time struggling in / the bloody dark’. The story, with its metaphorical yet bitterly literal description, told by a former colleague to the poem’s speaker, ends with the terrifying image of Denison lying in the bedroom of one of the ‘barren terraces’ as he ‘buffets at / his bedclothes like a netted penguin.’ All this might be unbearably grim if we didn’t feel that in some ways this is Howden’s narrative too, that what bleeds through the scarred landscape is a kind of love. skeleton runes of aerials in a grey sky fall. It’s a landscape beloved, too, of the everyman, Barlow, a denizen of the cinema back-row, who gives his evidence of the Fall as it might have occurred in wartime Burnley. “Frogspawn” finds him out fishing along the canal bank. ‘In Eden among green fern, Your Honour, / bashing among bluebells, they were at it together, / that nearly naked possing on rainbow ground.’ This is as near as Howden allows himself to lyricism, the voice of the dispossessed and the voice of the petty criminal combining in Jack Barlow who becomes by the poet’s admission his virtual spokesman. Howden’s own choice is almost always for the muscular verb, the noun doing service for the adjective – so much so, that at times it seems as if the language has been pumping iron. parachutes, seeding the river’s barren pasture. dragged her snot child through sun in the street. Altogether it might be like going fifteen rounds with an Ancient Mariner—down ‘Eden Street’s millstone funnel … In seams of blackened stone’ listening to the ‘bleak calculus / of our caste language’ – were it not for the variety of incident and personality that enliven this Selected. The scratch and losing team of footballers from “Pauper Grave” (1981) give way to the ostensibly weedy but actually clinically efficient Moscow Dynamo in “Barley Top” (2012). “The First Electric Street Lighting” illuminates, humorously, a whole sweep of late nineteenth-century history as well as the aspirations of a budding entrepreneur of the Calder/Brun valleys, though even this student of Edison, believing ‘Man is perfectible’, is denied the final word by the sardonic irony of the closing line. There’s amusement, too, at the randy apostasy of the notorious Rector of Stiffkey, and a certain amount of empathy for ‘the poor clown’ who ended his days ‘filleted by a mad lion’ on the promenade in Skegness. Keith Howden was born in Burnley in 1932, so it’s not impossible that he might have witnessed the last ever performance – in Burnley, in 1959 – of Phyllis Dixie, the legendary revue artiste. Exotic as she was, her story is strangely emblematic of the concerns of this book. A yearning for beauty, and the indignity of humanity brought low by greed, lust and the pervasiveness of the tawdry, are all components of the poet’s cry. It’s difficult to gauge what readers of the MeToo generation might make of his brutal indictment of the male gaze, but hidden among the feathers and the complicity Howden sees finally only the vulnerable and the sacramental. ‘She is Mary, / Marilyn. Comes on the mind’s screen, in Burnley, in the drab fifties, this Eve before knowledge.’ The history of Dixie’s subsequent early death from cancer is painful, but here at last she has found her sympathetic elegist. The sections from Lost Orisons (2015) and Not Bloody Gawain (2016) show no diminution of Keith Howden’s energetic anger. Images of Eden before and after the fall recur down the years of these Selected Poems, and to allow Howden’s argument is surely to agree with Tess of the d’Urberville’s little brother Aby when he contemplates the odds against living on a splendid rather than a blighted star – and concludes ‘’Tis very unlucky we didn’t pitch on a sound one’.